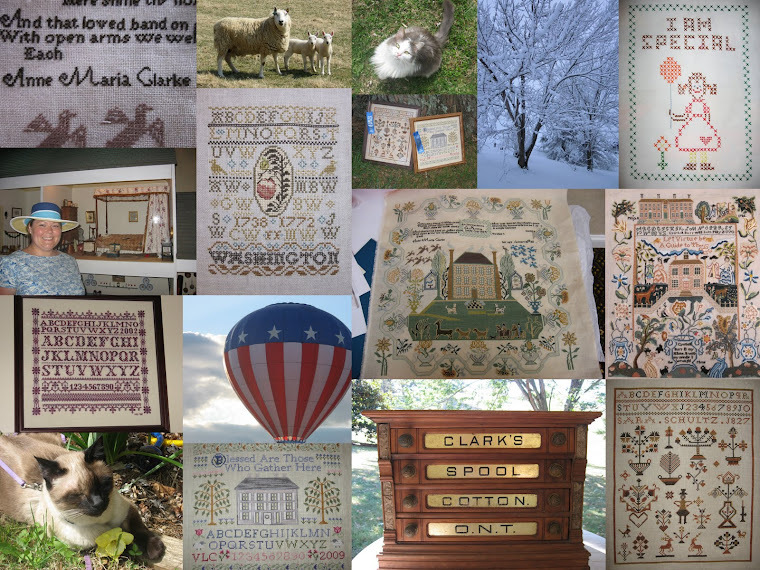 A Shenandoah Sampler: Some Richmond Progress, Blue Ribbons and a New Job! Some Richmond Progress, Blue Ribbons and a New Job! I trust that all of you are keeping cool while your needles are flying! It has been hot here in the Shenandoah, however, over the past two days the heat has broken a bit and the humidity has thankfully lifted. I do wish to mention a great giveaway over on Kim's blog Threadheads Unite. She is a stitchy/quilty person and is having not one but two giveaways...one for a stitchy person and one for a quilty person! Make sure to head over and check it out! Well, I have been madly stitching away on Richmond Sampler. I *finally* finished the flowers on the top border! Woo Hoo!! Now, I get to start the lovely over one verse. I think that I am going to focus on two or three words a week. That way I can get started on the birds and the massive house. I apologize for the horrible pics. I have tried everything to get a good snapshot of this sampler and to no avail. However, I have included a couple of close-ups. Eventhough the flowers have been annoying me, they are rather pretty. I decided to enter two of my latest framed pieces into our local county fair. And guess what??? I won FIRST PLACE for both! Now, last but not least, I have more fabulous news to report. It is official, I was offered a full-time teaching position and I accepted!!! I am absolutely thrilled and I cannot wait to start (next week!...eek!) For many months, I have had my eye on the Lizzie*Kate design, "ABC Lessons," and told myself that as soon as I had a job I would buy it for myself. And that is exactly what I did. I plan to stitch it and hang it in my classroom. I think that it will be perfect next to my desk. Thank you to all who have kept me and my job search in your thoughts and prayers. Your positive thoughts and well wishes worked! I am truly blessed to have such wonderful stitchy/blogging friends...you guys are the best! Well, I am off to watch my annual summer addiction...Big Brother! Stay cool and keep those needles flying! HAPPY DANCE HAPPY DANCE!!! YES! You have a teaching job~~~ I know that must feel awesome!!! I love the flower border in Richmond, but am more thrilled for you in landing the job~~~ Way big congrats from me to you!!! Woohoo, Valerie! I am happy dancing here for you! Terrific progress on the Richmond Sampler! Big congrats on the blue ribbons (so, who can you talk to about your valid concerns about where they display the needlework?) and a very big congrats on the new job! You are going to be fabulous! Congrats on both the blue ribbons and the new job! What an exciting week for you!! Congratulations on your new job and your 2 first place ribbons! I absolutely LOVE Sara Schultz but both pieces are very deserving of their first place status. I agree that your needlework (or anyone's needlework, for that matter) deserves to be shown in a more appropriate environment - I would definitely try to bring it up with someone there. Congratulations on your blue ribbons and on your teaching position! So much happy news! I have to agree with you about the stitching being displayed inside. I would probably be to scared to have my stitching in such a dirty area! Your Richmond sampler is looking beautiful, and I love those flowers! Hurray for you!! I know you're so excited about your new job and I can't wait to see the ABC's finished and ready for the classroom. Congratulations on your blue ribbons. I would be a bit ticked at the "homemaking" division showing with the livestock. Anyway, your beautiful pieces belonged with the art!! A big Congrats on landing your teaching position. Wonderful news. Love the flowers in the border of the Richmond sampler. The Lizzie Kate design is just perfect to celebrate your new job. Congrats on winning two first place ribbons at the fair too. Love all the stitching pictures, your Richmond piece is gorgeous and congrats on the blue ribbons. Woohoo on the new job that's so exciting :-). Wow! Fantastic all around! Congratulations on the blue ribbons AND the new job! That is so exciting! And your Richmond Sampler is gorgeous! I definitely think that Lizzie Kate ABC Lessons will be perfect for your classroom -- and you definitely deserved to buy it too! Yay for blue ribbons! And may I say that I am properly HORRIFIED that your needlework was subjected to such filth. I would say something if I were you! And I would take my soapbox when I said it! I forgot to congratulate you on the job! All the best to you! Congratulations on your ribbons! So well deserved because they're beautiful pieces. But I'm a little confused as to why those things are kept in the same building as the quilts. Your Richmond Sampler looks wonderful, and a huge congratulations too on your new job! I am a new follower. I found your link on another blog and love the sampler you are working on. I agree with you on the county fairs. I recently went to a fair in my area and they had the needlework displayed in open area. I was also surprised at how scaled down the needlework and agriculture were. They had more food and retail vendors than every before and all of the horticulture, needlework, quilting, art and photography were in one small barn. Sad really! Congrats with taking away 2 blue ribbons. Just found your lovely blog! Hello from Colorado! I totally agree about the change of venue for the stitching...I am from rural Canada and never entered my stitching in the local fair because of just that reason...dust dirt and manure! I love your Blessed Be!! Woo Hoo!!! Congrats on the new job, Valerie! I hope yo will love every minute of it! Your ABC lessons will be a great addition to your classroom. Richmond is looking great - can't wait to see more progress - it's gorgeous! I have to agree with you about where they exhibited your stitching.... did you say anything to the Fair folks? Perhaps a letter? Your Richmond sampler is looking lovely. Congratulations on your win, but I would have been very annoyed had my stitching been displayed in such a way.